3Instituto de Investigaciones Metabólicas (IDIM), Buenos Aires. ARGENTINA. 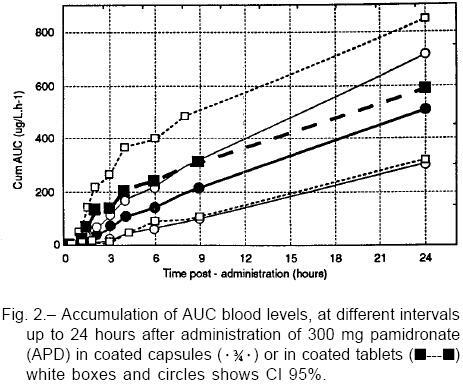 The net absorbable amount of pamidronate (APD), according to AUC values assessed in blood, in the customary dose interval of 24 hours, was found to be similar in 8 healthy young volunteers, who received single doses of 3 capsules of 100 mg APD (AUC0-24= 510.3 ± 91.5 µg/Lxh-1) and 2 tablets of 150 mg (AUC0-24 = 580.5 ± 117.6 µg/Lxh-1; p= 0.58) in the fasting state. Both formulations present acid-resistant coatings, designed to protect the mucosa of the upper digestive system from contact with insoluble particles of the bisphosphonates. Tmax values were different, and Cmax values presented a wide inter-individual variation, so that both formulations were not strictly bioequivalent. However, these latter factors were of minor clinical importance given the kinetic features of the bisphosphonates. In conclusion, both formulations afforded comparable bioavailability; that is to say that they can provide a sufficient amount of APD within the studied dose interval, so as to cause similar clinical effects. Key words: Pamidronate bioavailability; Ooral bisphosphonates. Biodisponibilidad comparable de dos formulaciones gastroprotectoras que contienen pamidronato. Un estudio cruzado en voluntarios sanos. Las cantidades netas absorbidas de pamidronato (APD), de acuerdo con el área bajo la curva de concentraciones sanguíneas, calculadas en el intervalo de dosis habitual de 24 horas, fueron en promedio similares en 8 voluntarios sanos; quienes en ayuno recibieron dosis únicas de 3 cápsulas de 100 mg APD (AUC0-24= 510.3 ± 91.5 µg/Lxh-1) y 2 comprimidos de 150 mg (AUC0-24 = 580.5 ± 117.6 µg/Lxh-1; p= 0.58). Ambas formulaciones presentan cubiertas resistentes al medio ácido, diseñadas para proteger las mucosas del sistema digestivo superior del contacto e irritación proveniente de las partículas insolubles del bisfosfonato. Los valores de Tmax fueron diferentes y los de Cmax presentaron una amplia variación interindi-vidual, por lo que ambas formulaciones no fueron estrictamente bioequivalentes. De todos modos, estas últimas variables son de una importancia clínica menor teniendo en cuenta las características cinéticas especiales de los bisfosfonatos. En conclusión, ambas formulaciones ofrecen una biodisponibilidad comparable; es decir, pueden proveer suficientes cantidades de APD durante el intervalo de dosis como para promover efectos clínicos similares. Palabras clave: Biodisponibilidad del pamidronato; Bisfosfonatos orales. The bisphosphonates make up a family of chemical compounds generally used by oral route to treat a variety of metabolic osteopathies. The scarce solubility that these compounds present in the digestive medium is one of the aspects that hinders most their absorption. The bioavailability of the oral forms is then very low1-4. However, the clinical efficiency shown by the bisphosphonates is sufficient to justify the use of the oral route. The greater proportion of the bisphosphonates inges-ted is not absorbed and may precipitate in the digestive tract causing a variable degree of irritation, so that gastro-esophagic intolerance is the main clinical drawback of these compounds5, 6. Several oral formulations of pamidronate (disodium 3-amino-1-hydroxypropyliden-1, 1-bisphosphonate or APD, CAS 57248-88-1) have been assayed. However, only a soft capsule, marketed in some countries, and a tablet made at the University of Leiden have proved to be tolerable, allowing long-term research on bisphosphonates in osteoporosis7,8. . Given the digestive drawbacks mentioned above, both were independently prepared with a coating resistant to gastric pH, thus avoiding the exposure of the bisphosphonate to sensitive mucosae of the esophagus and the stomach. 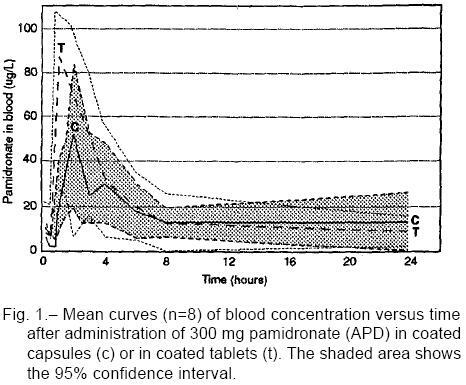 As these two APD formulations are the most widely described in the medical literature, it was of interest to determine whether the absorbable fraction of APD in the current dose reported.Subjects and methodsSelection of volunteers Eight volunteers, 4 women and 4 men, with a mean age of 28 years (range 24-32), a mean body weight of 63 kg (range 42.0 - 81.3), a mean height of 166 cm (range 151-173 cm) and in good health status, were included in the study. All subjects were instructed on the aim and procedures of the study before giving written consent to their participation, and they all completed the study according to protocol guidelines. Selection of volunteers and clinical biochemistry studies were carried out at the Institute of Metabolic Research (IDIM, Buenos Aires, Argentina) and serum drug evaluation assay at the Analytical Development Department of Gador S.A. (Buenos Aires, Argentina). Each participant responded to a medical questionnaire and was examined physically. Laboratory screening tests were performed prior to each dose administration phase. They included hemogram, hematocrit, hemoglobins and blood glucose biochemistry, BUN, creatinine, bilirubins, aspartate-aminotrans-ferase, alanine-aminotransferase, total alkaline phosphatase, total cholesterol, Na+, P+, Cl- and Ca++ , total proteins and electrophoretic proteinogram, and routine urine analysis. Abnormalities in clinical and biochemical parameters as well as pregnancy were causes of exclusion from the study. As volunteers were all in their fertile age, they were warned about pregnancy and protective measures were demanded during the two-month-study period. No medications were allowed during the study.Study designThe study was an open, randomized, balanced cross-over trial consisting in 2 experiments during which a single 300 mg APD dose of either formulation was administered orally with a 4-week drug washout interval. The starting formulation was randomly assigned, so that at initiation 4 volunteers received capsules and 4 received tablets. For both dosing phases, subjects were admitted to the institution at 7 a.m. in overnight fasting conditions (not less than 10 hours). Administration started at 8 a.m. Before dosing, a catheter was introduced into a forearm vein under aseptic conditions to facilitate serial blood collection. In all subjects weight, height, body temperature, heart rate, and systolic and diastolic blood pressure were determined and the bladder emptied. Either three 100 mg APD capsules or two 150 mg tablets were given with 2 glasses of tap water, in a standing position. Following protocol rules, a light lunch lacking calcium-rich food (i.e., milk, cheese) was allowed at 12 a.m. Blood samples were taken immediately after drug adminis-tration (time 0) and at 0.25, 0.50, 1, 1.5, 2, 3, 4, 6, 8, 24, 48 hours thereafter. Time 0 was considered the final moment of oral formulation ingestion with water. In addition, in three of the patients, urine samples were collected at intervals 4-8 (encompassing the expected period of a daily dose), 8-24 and 24-48 hours after dose administration. Blood and urine samples were conditioned in glass tubes, kept in the freezer at 20°C until their processing in Gador's Analytical Department. Every clinical event was recorded. Duration and relationship with drug formulation and management were evaluated in each case. Both the study protocol and the written consent form were approved by the institutional review board, ethics committee and the Food, Drug and Medical Technology Administration (ANMAT, Buenos Aires) belonging to the Ministry of Health of Argentina, following the Declaration of Helsinki principles for human research. Study medicationsOne formulation was an enteric coated soft capsule containing 100 mg of dry disodium APD, micronized in an oily phase mainly of lethicin (IG-7913, Gador SA, Buenos Aires) and currently marketed as Aminomuxâ, study batch # 41337. The other formulation was a 150-mg disodium APD enteric coated tablet developed by the University of Leiden (Leiden, The Netherlands) exclusively for research purposes, batch # AZL 93 AZ 2881. The range of APD doses in published clinical trials commonly varies from 100 to 600 mg/day, or even more. Thus, a 300-mg single dose was chosen to compare both formulations, in agreement with clinical usage and due to the same enable comparison of both formulations. Plasma and urinary pamidronate levels were measured by high performance liquid chromatography9-14. Monosodium alendro-nate was used as an internal standard. Calibration standards and blanks were prepared in the same biological fluids as the samples15. Serum proteins were precipitated with trichloroacetic acid and subject to double co-precipitation with calcium phosphate. Urine was filtered and subject to double co-precipitation with calcium phosphate. The final pellet was dissolved in buffer pH 9.0, derivatized with fluorescamine, washed with methylene chloride and injected into a chroma-tograph consisting of a Shimadzu LC10-AS pump, SCL-10 A system controller, SIL 10-A automatic injector, RF-535 spectro-fluorometric detector and CR-7 A data processor. Detector wavelength settings were excitation at 390 nm and emission at 480 nm; 100 µL of sample or standard solution were injected on a Hamilton 250 x 4.1 mm PRP-1 column with a mobile phase containing 10 mM borate buffer and 1 mM/L EDTA, adjusted to pH 9.0. Flow rate was 0.8 ml/min. Pamidronate detection was linear with r2: 0.994 with an 5:1 increase of LOQ, from 2 to 10 ng/ml, due to the experimental concentration procedure. However, many serum pamidronate values ranged between accepted LOD and LOQ range. Precision expressed as coefficient of variation ranged from 2-3% for higher values to approximately 10% near LOD and 20-40% for values near LOD. After completing the two experimental stages, data were grouped according to the formulation studied. They were also grouped according to collection sequence, to check whether there were meaningful influences related to the study design. Concentrations values below method LOD were set to zero. All values were entered into a spreadsheet and expressed as means (± SEM). Blood level-time curves, Cmax and Tmax were obtained directly from observed data. The area under the curve was calculated by the trapezoidal rule, from 0 to 8 h (AUC0-8) and from 0 to 24 h (AUC0-24). Other kinetic variables in blood samples and some urinary data are here described as secondary end-points, as distribution volume (Vd), drug plasma clearance (Clp), and terminal half life (t1/2), which were all obtained by the PK-Calc PC program written by Shumaker RC (Merrel Dow Research Institute, Cincinnati), following well-known mathematical procedures. Every graphic and statistical test (Student's t-test for paired samples at 95% significance level, two-tailed tests) were then evaluated with Statistica® (MicroSoft Co, Tulsa). Evaluation of 8 subjects allowed the detection of differences in AUC of up to 25% with a 1-b < 0.20 error according to the Potencia® program (developed by V. Septiarsky, Faculty of Agronomy, University of Buenos Aires, Argentina), within the range of data observed in the present study. As a rule, with medications presenting high absorption rate, differences outside the 0.8-1.25 range between studied AUCs are considered relevant. 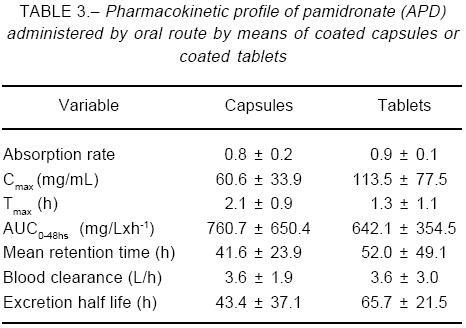 Considering that intestinal absorption of pamidronate is minimal in this case, from 0.5% to 5% of total dose, the above-mentioned difference margin is regarded acceptable for anticipating equivalent clinical effects between formulations.ResultsThe main features of participating volunteers are given in Table 1. One volunteer reported mild heartburn and myalgias after tablet intake. Symptoms were self-limited and did not require any supportive measure. Comparing pre-phase I and pre-phase II laboratory and clinical parameters values, no abnormalities were found. Nevertheless, some serum proteins (albumin, a2 globulin and g globulin) as well as blood pressure, showed a significant decrease within the normal range of values, in the pre-phase II analysis. Moreover, alkaline phosphatase increased within its normal range, before phase II drug dosing. Relevancy of these changes could not be determi-ned within this study design, but in any case as the bisphosphonates inhibit bone metabolic activity, the observed increase in alkaline phosphatase highlights the apparent lack of significant medication effect given during the first phase on bone metabolism during the second phase. As expected, a wide variability in blood APD concen-tration was observed inter-individually. Likewise, drug concentrations varied within individuals between both administered formulations, but differences failed to reach statistical significance. Plasma concentration curves are shown in Fig. 1 and AUC values accumulated up to hour 24 are shown in Fig. 2. With the exception of few pami-dronate concentration values, assessed at 15 and 30 minute blood samples, all the others were calculated over LOQ concentrations (10 ng/mL). 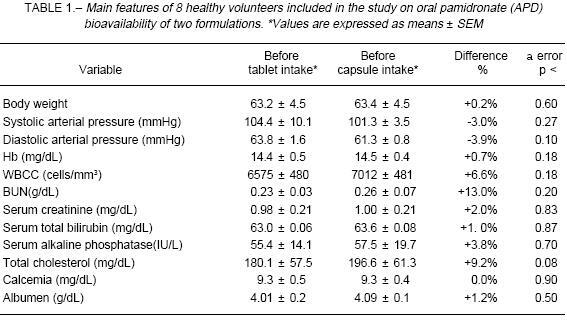 In 3 individuals AUC0-24 was greater with the tablet, in 2 with the capsule and in the remaining 3 differences failed to exceed 5% between them. The relationship between AUC0-24 and antropo-morphometric variables is shown in Table 2. As may be seen, there was no correlation between corporal parameters and the amount of drug absorbed. After 8 hours of administration, capsules showed roughly half the AUC0-8 value for tablets (capsules, -48%; p=0.062), but at the end of the dosing interval differences in AUC0-24 were not significant (capsules, -12%; p=0.58). The trend toward a lower Cmax value observed with capsule intake (-29.0%; p=0.20) seemed to be counterbalanced by a longer Tmax of such formulation (+75.0%, p=0.02). 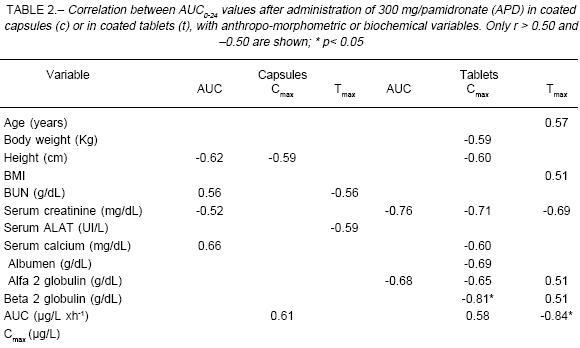 Other pharmacokinetic parameters are listed in Table 3, while Fig. 2 shows the limited data here obtained from urine samples. DiscussionThe experimental design, trial objective, and the observed results deserve separate comments.Experimental designThe bisphosphonates are compounds mostly used in adult and senile individuals. However, for this particular formulation study we have preferred young subjects, implying less sources of pharmacokinetic data variation; for instance, drawbacks related to gastrointestinal motor function and secretion, renal filtration, and changes peculiar to skeletal metabolic turnover. Nevertheless, considerable individual variation was observed so that other studies in special sub-populations will require a greater patient sampling. Twelve time-points were chosen from 0 to 48 hours. The period covers the Tmax plus 30 plasma t1/2, as previously described with a solution of 99mTc disodium APD16. However, APD in solution lacks a lag time, dependent on the pH-resistant coating. A bone-derived terminal half-life of about a year has been suggested from animal studies17. Accordingly, a postponed elimi-nation phase was expected in this study. The potential detection of part of such slow elimination phase was the reason to include a point at 48 hours, beyond the usual administration lapse of 24 hours. Separation time between the two administration phases of the study was of one month. This period seemed to be adequate, having also been used in previously published trials with another aminobisphos-phonate whose skeletal t1/2 was estimated to be 10 times that of APD3. Calculated final t1/2 for the two formulations tested in this study confirms that sampling intervals were correctly chosen.Objective of the studyAUC0-24 was compared as end-point for this trial. This single criterion was applied on considering the peculiari-ties of bisphosphonate kinetics. Indeed, pharmacological features of the bisphospho-nates are atypical inasmuch as there is very low corre-lation between drug plasma levels and pharmacological action4,18. In fact, these compounds act insofar as they may bind to bone surfaces whose mineral phase is exposed, that is, mainly erosion surfaces and those of mineral apposition (biophase of the bisphosphonates). Due to this, clinical response seems to depend on the individual size of these surfaces rather than on variations in absolute drug plasma concentration4, 18. Some bisphosphonates are administered in low doses by oral route; as for example, in the treatment of osteoporosis, 100 to 300 mg/day of APD have been indicated. In this case, the biophase is far from being saturated, since, with greater doses, it is possible to obtain more pronoun-ced pharmacological effects. Therefore, quantities admi-nistered daily would seem to operate as a micropulse, kinetically limited by the short period of intestinal absorp-tion and distribution on one hand and by rapid renal filtration on the other, without undergoing intermediate processes of biotransformation4. Indeed, there is no metabolite known for APD, no first pass effects in soft tissues and the drug completely resists the effect of digestive media. A small quantity of the given dose remains adsorbed in the biophase and, in contrast to what occurs in peripheral compartments, the drug remains there (inactive?) for a lengthy time, with a mean elimination half life of several months3,18. The therapeutic concept in osteoporosis, is to intervene every day on new skeletal sites where the mineral phase is exposed. This partial inhibition is disclosed by monitoring bone metabolism with biochemical markers of bone resorp-tion19. The mode of action of these drugs is slow, cumulative in effect in skeletal mass and at the end of a year it is possible to reverse negative bone balances, achieving gains in mineral bone density of roughly 3-5% in trabecular areas and of 1-3% in cortical areas20-22. If APD is administered by means of different formulations, the size of the daily micropulse is related to the area below the plasma concentration curve, that is to say, the total amount of drug exposed to be uptaken by the skeleton within the dose range. AUC´s may reasonably be compared better than other pharma-cokinetic bioequivalence variables. Furthermore, since the doses of these compounds given by oral route lack acute effects, no clinical effect has been related to the Cmax or Tmax in blood. However, these two last variables are certainly crucial when the drug is administered by parenteral route, in doses up to 30 times higher than the fraction absorbable by digestive route. In this case the acute effects fail to correlate with the skeletal action mechanism, but instead with an interaction with bloodstream calcium. 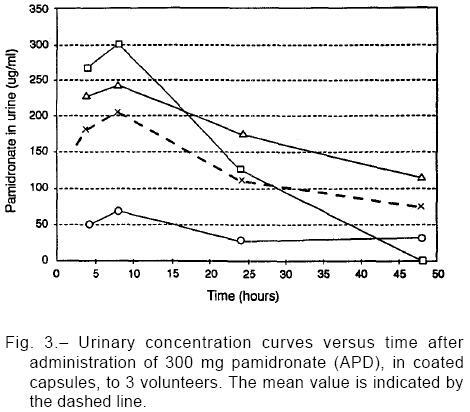 Such interaction is of course undesirable and commonly avoided by infusing the drug slowly.Observed resultsWith this practical interpretation, as AUC values are similar for the two formulations studied over the dose interval period (24 hours), we assert that both display comparable bioavailability. The 12% difference in such a small absorption fraction, barely amounting to less than 0.2 absolute %, lacks clinical relevance and is surely exceeded by the intra-individual variation characteristic of bisphosphonate kinetics. For such reasons, the resulting clinical effect may be estimated to be equal with the use of one or the other formulation. However, as already stated, this will also depend on the influence of other factors unrelated to the absolute quantities absorbed23. Due to this, on comparing data from diverse clinical studies, the severity of the underlying metabolic picture must be specially considered, as well as the age distribution of the studied volunteers and the additional osteotropic medication allowed, among other factors. All of them affect the size of the biophase, which must be taken into account before attributing a variation in results to theoretical pharmaceutical differences in the preparations. Both formulations, however, are not strictly bioequi-valent. It is widely recognized that at 8 hours after intake the AUC obtained with tablets (+48%) is greater than that with capsules, so that the kinetic profile of the micropulse produced by the tablets is different from that of the capsules. It may be supposed that this depends on dissimilar disintegration times of the coating (lag time) of the formulations. By and large, the absorption phase in all cases was invariably extended up to hour 4 after intake, when the fasting period was completed. It is not clear why the AUC value provided by the capsules is greater at later hours during the dose interval towards the end of the day. Considering again the scarce relevance of kinetic variables assessed in blood, as regards bone effects of the bisphosphonates, in principle the indicated differences do not seem pertinent to the clinical management of APD administered by oral route. That is to say, for a bisphos-phonate formulation comparison, a strict bioequivalence does not matter as much as a comparable bioavailability. Other formulations that appeared in the literature, as non coated tablets or effervescent powders(24), should not be comparable to the two here studied. Acknowledgements: The authors thank Dr. Socrates Papapoulos for kindly providing the tablets used at the University of Leiden. The soft capsules (IG-7913) were supplied by Gador S.A. The study was partly supported by grants from the Foundation of Metabolic Research (FIM) and by Gador S.A., Buenos Aires, Argentina.